It seems that fall snuck up on us here in Colorado. Apparently, the drought in the mountains has affected the early changes. The spectacular arrays of new colors in the air are giving us such great fall vibes. With my excitement brimming, I couldn’t resist getting my first fall table setting set up for a little luncheon. 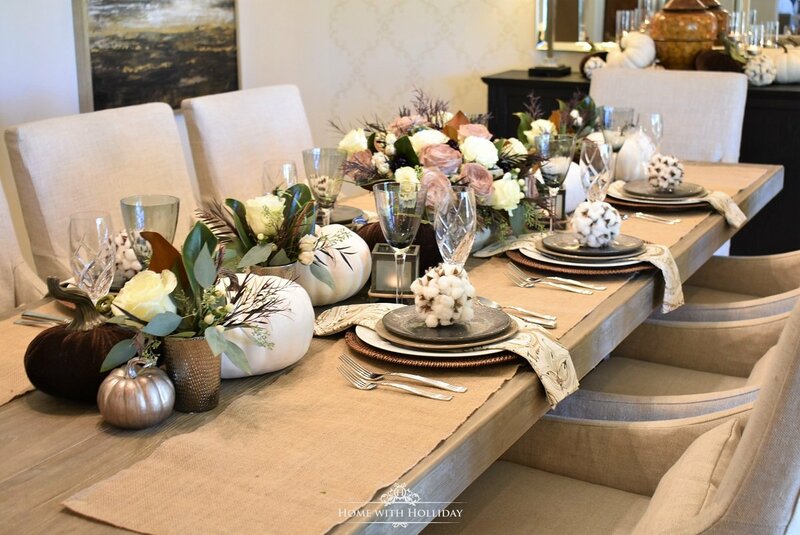 Thank you for joining me as I share this Fall Table Setting with Brown and White Pumpkins! I wanted to create a centerpiece that could still look nice once the flowers expire. Once the flowers have run their course, I can remove them and push all of the other elements of the centerpiece closer together to be ready for the next event. As mentioned in a few earlier posts, my starting point for my fall decor this year was the brown velvet pumpkins from last season. I invested a good bit of money in them but knew there would be so many ways to use them in years to come. I also used them for this vignette for my island a couple of weeks ago. To see the whole post, click here. To keep things simple (and to save money! ), I started with these great burlap table runners. Using table runners instead of placemats can not only cost less but is also a bit more creative than utilizing typical placemats. Plus, they can be reused for so many other applications. For the napkins, I am reusing a very neutral paisley napkin from Pottery Barn. The taupes, tans, white and silver tones are perfect for this tablescape! Layering is key when it comes to putting together your place settings. For the chargers, I used these rattan chargers that works so well the neutral and brown tones. Especially considering the burlap runners, I wanted to keep the majority of the table setting pretty casual so they did the trick. A simple white plate grounded the napkins and the two salad plates tied everything together. If you know me well, you know that I typically like to pop in a touch of glamour in most table settings. This is no exception! I found these shimmery silver salad plates at TJ Maxx a while back and I knew they would have many uses and they were a perfect topper for these place settings! Not only serving as a party favor, these adorable cotton spheres really helped set the tone for this fall table setting. And, my guests got to go home with a new Christmas ornament. I found these in the Christmas ornament section at Hobby Lobby and I have linked the same ornament below. Aren’t these just the cutest?!?! For the glassware, you know I like to mix them up! The cut crystal swirl of my Mikasa water goblets added a tiny bit of glamour and the grey wine glass from Cost Plus coordinated beautifully with my silver salad plates. This centerpiece was super easy to put together. Simply place a variety of pumpkins randomly down the length of the table. The more texture the better. I used both velvet pumpkins and smooth, painted pumpkins to mix up the textures. The only other additions were the flowers (more on that below) and the votive holders. You could really use any type of votive holder, but I chose some of my more rustic ones for this application. I have owned these for over 10 years and I use them often. Don’t the Magnolia leaves look so beautiful with the burlwood and chestnut wood tones of my antiques in this room?! Saving the best for last, I am so excited to talk about the flowers. For this project, I collaborated with my good friend BJ Dyer and his wonderful team at Bouquets in Denver. They actually did the flowers for the event I spoke about earlier and did an amazing job! Even though we worked together on the design with some stipulations from me of wanting to include white roses, magnolia leaves, and eucalyptus, the final result blew me away!! The inspirations for the dusty rose tones of the White Ohara Roses came from the tiny bit of those tones that came from the small silver pumpkins I featured in the centerpiece. BJ and his team went to the great effort of air-brushing them by hand! The outcome was beyond my imagination and added such a custom touch that stunned my guests! We planned for some ancillary small arrangements to work into the centerpiece and around the room (another post on that coming soon!). Adding other similar arrangements to the centerpiece not only adds drama but allows all of your guests to enjoy the flowers by spreading them down the table. After the function, I re-utilized the tiny arrangements throughout my house in bathrooms and on other tables. Bonus! I know this post is photo heavy, but there were so many images I couldn’t resist sharing. Thanks for hangin’ in there with me! Here are a few more shots of the room. Once the event was over, I still ended up with a lovely fall centerpiece that lasted for almost two weeks. Since then, I have removed the expired flowers and pushed all of the remaining elements together into the middle of the table so it is ready for the next function! 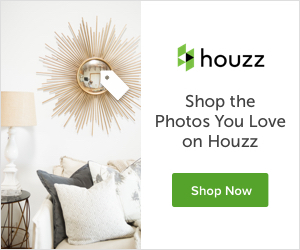 Love the use of the runners – not just any runners – those runners – great look! I thought I commented on this already! SO lovely, Holly! Your centerpieces are always amazing, and LOVE the table runner idea! Gorgeous and classy. I love it all!